The decision to build a marketing team versus working with a variety of agencies can be one that makes or breaks a company. Locking your business into a rigid internal workflow can limit creative thinking and innovative strategies. Here are a few benefits that working with an outside agency can bring. There are many variables to consider within this debate. In the end, it really depends upon factors like available headcount, corporate politics, local talent, and more. 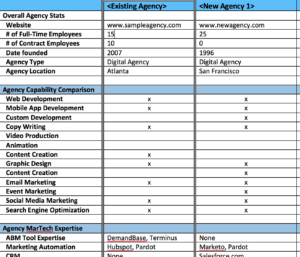 Below, this post discusses reasons “for” hiring an agency. Working with an outside marketing agency means you’re guaranteed to get a fresh flow of new ideas and creativity, even if it’s the same agency you’ve worked with for years. Agency teams grow and change much more fluidly than the more permanent nature of employment allows. Resources are allocated within the agency based on need, so you’re never left without enough manpower. Every once in awhile you may need to pause the marketing spend or temporarily reallocate funds. With an agency, it’s as easy as sending an email. With a full marketing team, it is guaranteed to be a bit more tricky. With an in-house team, you will depend on one employee to handle many different channels and that can leave them feeling overwhelmed. With an agency, you are usually getting the in-house expert in whatever marketing category you need, whether it’s creative, digital marketing, branding or something else. Be sure to check out our list of the best marketing agencies to find one that’s right for you!